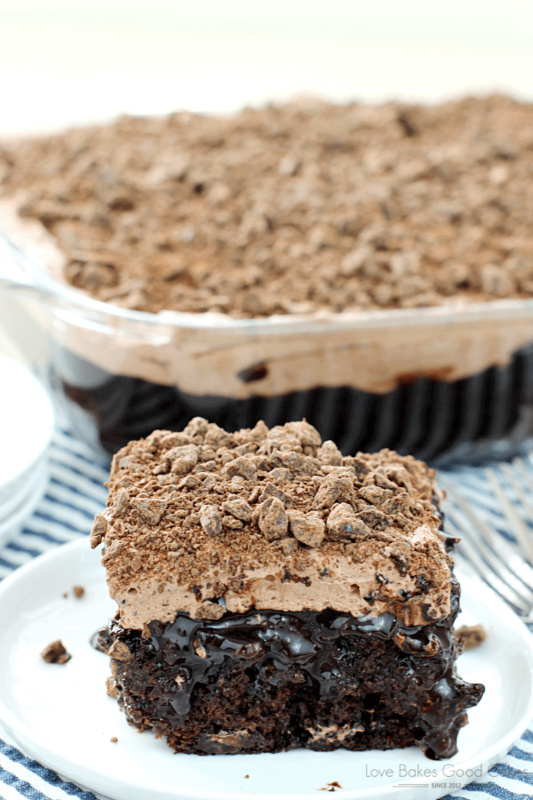 Fudgy brownies topped with a lusciously decadent French silk pie filling, whipped topping, and more chocolate. 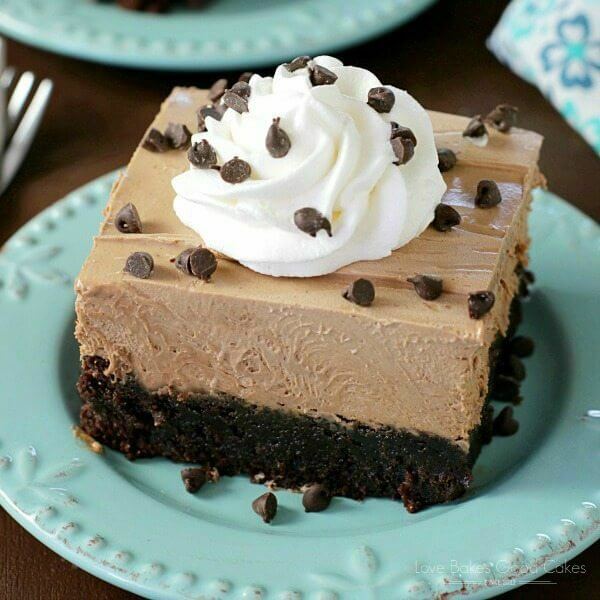 This French Silk Pie Brownies recipe will become your “little black dress” of desserts! Have you ever made a dish and instantly knew it was a winner? 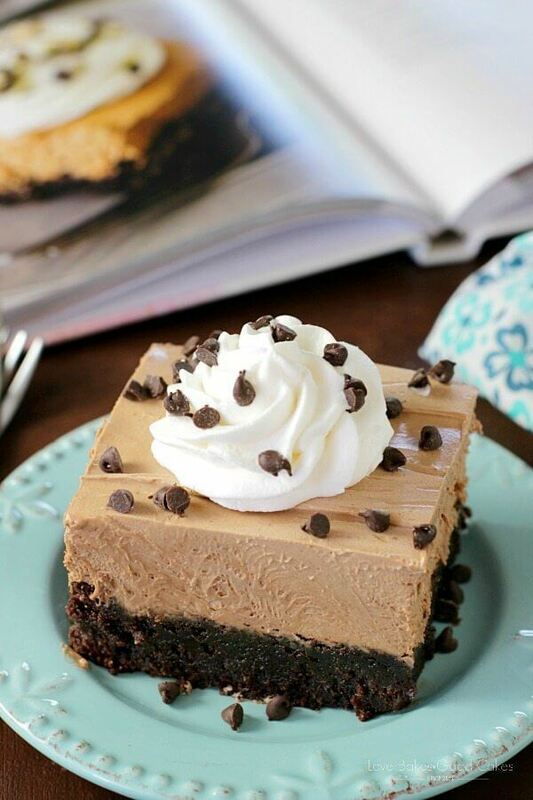 This French Silk Pie Brownies recipe was exactly that! My husband even asked me if I could make it again so he could take it to work – and he never asks to take stuff to work to share! 😍 I already have plans to make this for our Labor Day cookout and when we have friends over for dinner next month! 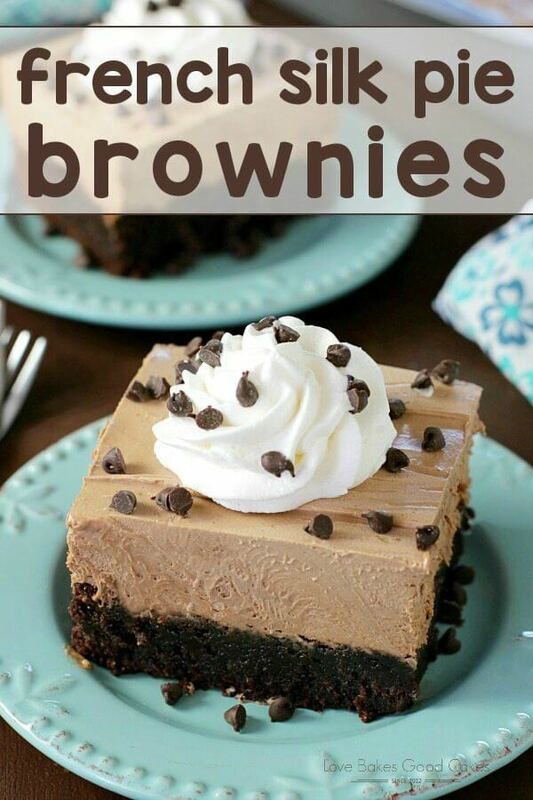 This recipe starts off with a boxed brownie mix. It gets topped off with an easy to make French silk pie filling, then a layer of whipped topping. Chocolate shavings or in my case, mini chocolate chips, make the perfect garnishment. I wish I could take credit for the delicious treat, but I cannot. 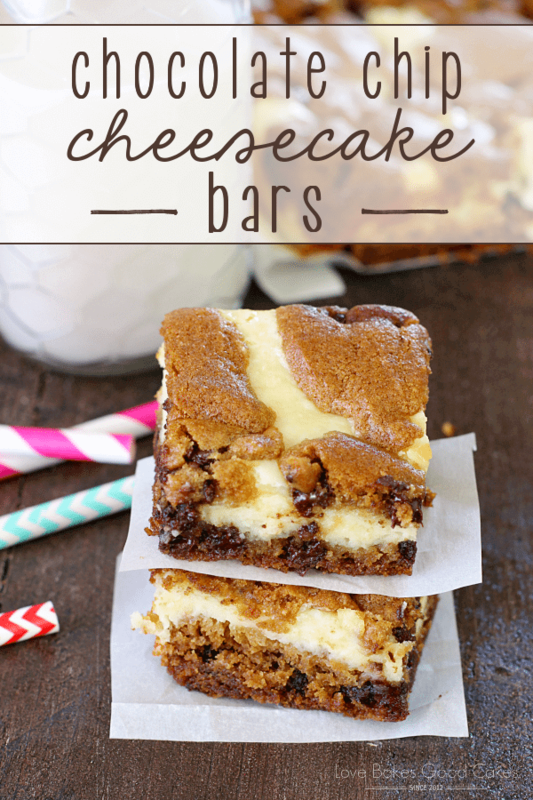 This recipe comes from my blogging friend, Hayley Parker of The Domestic Rebel. She is such a rock star! 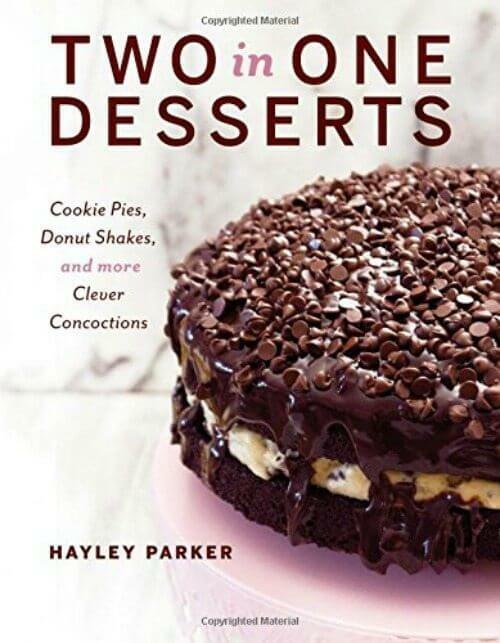 Her newest cookbook, Two in One Desserts, hit shelves June 20th and is available wherever books are sold, including on Amazon. If you love creative dessert recipes, this is a must have cookbook! Two in One Desserts (you can buy it HERE) is brimming with decadent dessert hybrids. They are easy, creative, fearlessly fun, and one-of-a-kind! 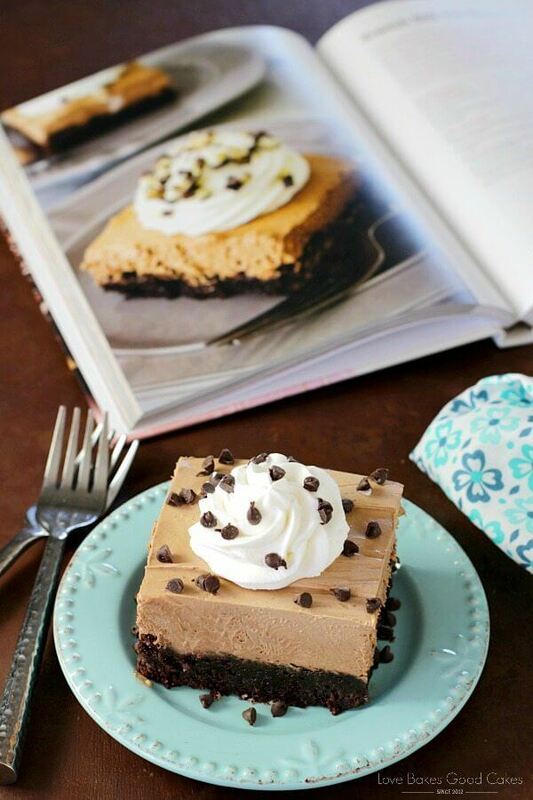 I hope you have better luck deciding which recipe to try first or next, because I want to try them all – and if this French Silk Pie Brownies recipe is any testament to the other recipes, I’ll also be adding stretchy pants to my next shopping list! Actually, I suggest you try this recipe first because it is the bomb-dot-com. 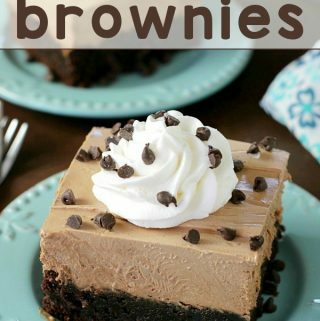 Here are some of the other recipes that caught my eye: Carrot Cake Gooey Cookies, Chocolate Chip Cookie Dough Brownie Bomb Cake, Donut Upside Down Cake, Muddy Buddy Bars, Pecan Pie Gooey Bars, Fudge Brownie Pie, Baklava Pie, Fruity Cereal No-Bake Cheesecake, and Brownie Batter Mousse ….. I don’t even know how I’ll decide which recipe to try next – they all sound soooo good! Microwave the German chocolate pieces with the butter in a large microwave-safe bowl on HIGH for 30 seconds. Stir, then melt for another 15 seconds. Stir until smooth and melted. To the melted chocolate mixture, beat in the cream cheese and confectioners' sugar until combined. Fold in half (8 oz.) of the whipped topping. Spread the French silk filling over the cooled brownies. Top with remaining whipped topping and garnish with chocolate curls, if using. Refrigerate at least 4 hours, or until set, before cutting into squares. These are SO delicious! And so addictive! Yummmy! i must try at home for my kids. The texture looks so amazing! It makes me want a slice immediately. Thank you for sharing the recipe!